Blockchain cybersecurity company BlockSafe Technologies, has just launched the presale round of their SEC compliant security token offering. The BlockSafe ERC-20 security token (BSAFE) is a revenue-generating security token in a full compliance with SEC securities regulations. The current presale initiates a token offering seeking to raise $27 million in total funding with the STO planned for the end of this year. BlockSafe plans to use the funds to commercialize and market their blockchain security solutions. Participating in an STO is very similar to participating in an ICO, but since security tokens are actual financial securities, the tokens are backed by something tangible like tangible assets, profits, or company revenue. While most tokens currently available are utility tokens, many leading experts believe that this may shift soon, as the market develops and Wall Street invests in security coins. STO investors are investing with the expectation of receiving future cash flows, dividends, or voting rights directly tied to the security being issued. Because they derive their value from actual securities, security tokens are considered investments, which means additional regulatory and reporting requirements for the issuing entity. Many companies are just beginning to enter the securities scene. Polymath is one company that believes that the next mega-trend in crypto is the emergence of securities tokens and enables trillions of dollars of securities to be issued and traded on the blockchain. When companies release their Security Token Offerings on the Polymath platform, they will have been guided through the complex legal and technological processes before issuance, Polymath explained in a blog post. The tokens released this way are intended to be compliant with KYC/AML requirements, and securities laws in whatever jurisdictions they touch. Polymath has recently partnered with Blocktrade.com to provide liquidity for security tokens. Swarm Fund is a platform for tokenizing real-world assets using the SRC20 protocol, a cryptographic standard for security tokens, and for listing security tokens for sale. The tokenized objects become “assets” that can be easily managed, governed and traded. SRC20 security tokens represent ownership of part of an object or “asset”, allow holders to manage that asset through voting, secure a right to any revenue streams from the asset, and are tradable in a regulatory compliant manner. Swarm Fund has recently entered an agreement to list security tokens on OpenFinance Network (OFN), the trading platform for tokenized securities. Harbor is a compliance platform for tokenizing private securities such as real estate, company equity, investment funds, fine art, etc. The platform ensures that tokenized securities comply with existing securities laws at issuance and on every trade, everywhere across the globe. Harbor seeks to power the future of crypto-securities by building a decentralized compliance protocol that standardizes the way securities are issued and traded on blockchains. 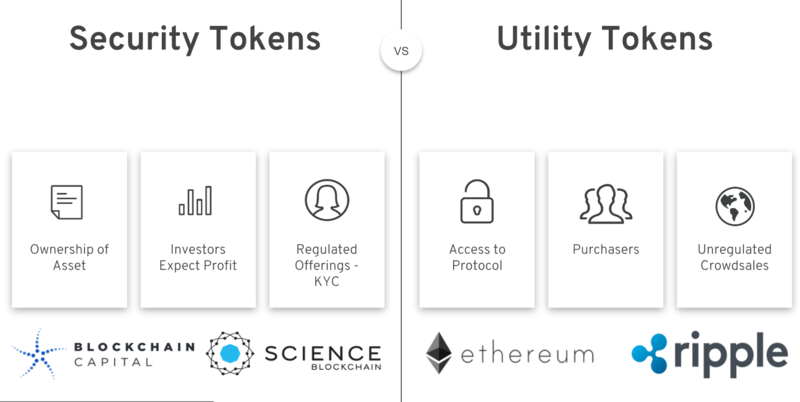 Securitize is a technology that provides an end-to-end platform for issuers that are seeking to tokenize assets issued by funds, companies, and other entities. Companies such as Blockchain Capital, SPiCE VC, Coinmint, Realecoin, and Lottery.com have worked with Securitize to seamlessly tokenize their securities, raise capital, enable increased investor liquidity, and deliver value to token holders in innovative ways. Blockchain Capitalis a pioneer and the premier venture capital firm investing in Blockchain-enabled technology companies. In 2017, Blockchain Capital raised $10 million by issuing a blockchain token (BCAP). Bcap is believed to be the first company to introduce a public offering for a securitized token. The tokens were offered on a limited basis to a maximum of 99 accredited U.S. investors under exemptions from registration with the U.S. Securities and Exchange Commission. Science Blockchain is a fund and incubator that focuses on blockchain investments. The fund was raised through a security token offering. The platform says on its website that buying a Science token is an investment in a security. Lottery.com is a mobile lottery service that uses blockchain technology. The platform’s vision is to raise significant funds to help solve the most pressing humanitarian needs across the globe using impact raffles, sweepstakes, and other games of chance. The company’s private STO is about to come to an end. Holders of this securitized token will receive financial yields depending on the gross raffle sales. SPiCE is digitizing the securities of its venture capital fund, which will invest in technology companies. SPICE is the fourth security token ever, the first tokenized closed-ended fund, and on track to become the first security token to be traded on a regulated trading platform. The tokenized nature of the fund lets investors enjoy liquidity that allows them to trade their tokens without waiting for an exit or specific event. Tokenization of securities implies that financial assets such as equities, bonds, futures, and stocks, can be transacted through use of digital tokens. tZERO, a security token exchange, and a subsidiary of Overstock.com, wrapped up its security token offering (STO) on August 6. The STO announced late last year almost immediately saw some 2,000 investors and $100 million committed to the platform, according to Overstock.com founder Patrick Byrne. The platform seeks to be the haven of ICOs that are compliant with FINRA and SEC regulations. Templum is an innovative financial technology company. It is a marketplace for Tokenized Asset Offerings (TAOs) allowing accredited investors to participate in investment opportunities. Templum supports trading of ICOs as securities and allows users to issue new tokens through ICOs on the platform. The company is compliant to regulations from agencies such as Financial Industry Regulatory Authority (FINRA) and the U.S. Securities and Exchange Commission (SEC).